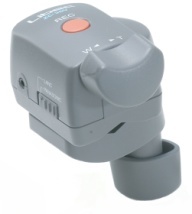 The ZC-3DV is a universal controller for LANC* and Panasonic Mini DV or HDV cameras, simply change the switch. (PAT) Zoom speed is variable from slowest to fastest by a very sensitive thumb switch. Equipped with outlet cable. Versatile usage - ZC-3DV clamps on tripod panhandles, monopod, stabilizer and other similar devices. Lightweight and compact size. An incomparable combination of value and quality.